A partnership between government agencies and businesses seeks to foster a new attitude about natural hazards to make them less catastrophic. More jobs with higher oil prices? 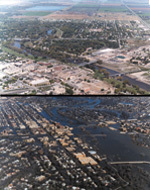 Top: looking north at Grand Forks, N.D., before the Red River of the North overflowed its banks April 18, 1997. Bottom: looking north at the same scene from a slightly different angle on April 24, 1997. The river has flowed over the bridge and into the town streets. By Vern Whitten Photography, Fargo, N.D.
Where on Earth? Answer for the March issue. Apply for the Geotimes summer internship!